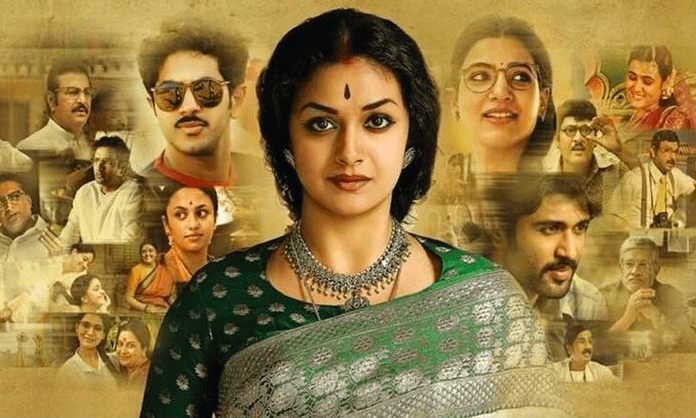 Mahanati Movie is Release LIVE UPDATES: Review, Audience Reaction And Many More: Director Nag Aswin’s Telugu movie Mahanati starring Keerthy Suresh, Dulquer Salmaan, Samantha Akkineni and Vijay Devarakonda, has to receive positive review and rating from the audience. Mahanati is the biopic of South Indian actress Savitri and it is also released in Tamil as Nadigaiyar Thilagam. Siddhaarth Sivasamy has written the screenplay, while Sai Madhav Burra penned dialogues for the movie. The producer is C Ashwini Dutt, Swapna Dutt, Priyanka Dutt under the banner Vyjayanthi Movies and Swapna Cinema. Mahanati is the first ever south Indian biopic on the life of the veteran actress Savitri. The movie throws light on some important events of her life both as a superstar and a person. The film is bringing out certain exciting and lesser-known aspects of her life. Keerthy Suresh has played the titular role in the film Mahanati, and she has done justice to it. Keerthi’s performance is the highlight of the movie. Dulquer Salmaan, Samantha Akkineni, and Vijay Devarakonda, who have played significant roles and done justice. Mahanati has excellent production value, and Mickey J Meyer’s music, Dani Sanchez-Lopez’s cinematography, Kotagiri Venkateswara Rao’s editing, dialogues, makeup and recreation of her era are attractions on the technical front, say the audiences. We bring you some viewers’ verdict on the movie sharing on Twitter. Continue to read audience’s response. So, these are the points to describing the Mahanati movie is release LIVE UPDATES Review, audience reaction and many more. Comment your viewpoints on the Article as mentioned above.